Click on the boxes below to download any of our free posters or the flyer featuring information about coonhounds as pets. No charge--just print and distribute. We encourage you to bring them to shelters, rescues, veterinarian offices, pet adoption events, or any other place they might catch the attention of people looking to adopt a handsome family dog with lots of personality! Hang one of our 8 posters on a kennel gate and watch the magic happen! 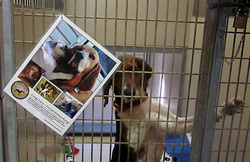 Our bright, colorful posters attract potential adopters. They stop to look at the cute pictures. The hound comes forward to socialize, as they are very well known to do. And the conversation of love begins! The Wisconsin shelter representative who took this photo told us that the wait time has reduced from months to weeks for coonhounds and foxhounds using our posters. Use the Contact Us page to send a request including a contact name, facility name and address, and web site URL. Announcing our newest poster: The Joy of Toys! "Long Ears = Toy Joy"
What can be more fun than watching dogs enjoy their toys? From the silly puppy with the curly tail helping Mom out-pull their playmate to the long droll face of a Black & Tan coonhound sucking a pacifier, this poster will make you laugh out loud. Goofy coonhounds and foxhounds always lighten your mood! Every one of these photos has been kindly donated by a coonhound or foxhound family to Coonhound Companions for your use, with hope that it will inspire more people to consider adding a long-eared member of the family. See Happy play pull-my-rope with his two-legged brother. See Maggie holding her blue ball gently in her mouth with an expression that reads, "Mine, isn't it?" What about dark-eyed Sugar curled up with her chin on her teddy bear? Could she be any sweeter? Share with everyone you know that coonhounds and foxhounds are loving and soulful companion dogs who deserve to be welcomed into the home, like other hunting breed dogs such as Labs, retrievers, setters, and pointers. Download this poster and others on this page, and print them all. Take them to your local shelter, pound, or rescue, and ask if they may be posted near adoptable coonhounds and foxhounds and mixes. Laminate them for the shelter environment if you can. These posters can help more hounds find homes more quickly! Celebrating the charms of senior coonhounds! There's no soul like an old soul and senior coonhounds and foxhounds are irresistibly soulful! With their large, dark eyes framed by impossibly long and silky ears, you will be enchanted forever. Elvis, the stunning Redbone featured on this poster, is typical of our beloved coonhounds. He is very content to laze for hours but still has plenty of get-up and go when you want to go to the dog park or take a walk downtown. We call it the "on-off switch" and coonhounds and foxhounds have great ones. And don't believe what you hear about old dogs and no new tricks. Coonhounds and foxhounds are intelligent and resourceful. They are excellent listeners and they LOVE treats. 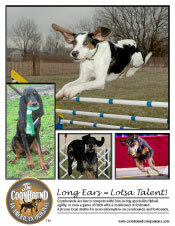 You go right ahead and train that older long-ear dog for agility or obedience or scent work! You'll have a blast. Tell the world that adult and older adult coonhounds are wonderful, easy companions and couch potatoes suitable for busy families. Download this poster, make copies, and post them wherever coonhounds are looking for homes, such as local pet stores hosting adoption events, shelters, rescues, and vet clinics. A sincere thank you to those who contributed photos to our poster! We appreciate you. Heartwarming pictures of coonhounds and their four-legged friends! Gentle coonhounds and foxhounds are generally friendly with critters of all types, unless of course they have been trained to hunt them! Because they have long been bred to mingle in hunting packs, they mix especially well with other dogs, even those breeds that might be a bit confrontational such as terriers. Typically coonhounds and foxhounds are social with horses and other larger animals too. And when socialized with small animals like cats early in life, they can be very friendly with even the smallest kittens. New coonhound families should take special care when introducing their cats to their new hound if their history with cats is not known. Longtime coonhound and foxhound families will tell you that their dogs can be readily trained to ignore farm animals and to redirect interest into tracking scents. 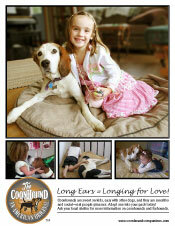 Tell the world that coonhounds can make great pets in families with lots of other animals. Download this poster and post it wherever coonhounds are looking for homes, or print copies and ask if local shelters and vet clinics will let you post it. Thank you to those who contributed photos to our poster! And there's more ... please keep scrolling down! Sensitive coonhounds are deeply devoted to their people ... they seem to read your mind. They seem to know when you want to snuggle, when you want to take a walk, and when you want to concentrate on work. Those big brown eyes see and understand so much. Coonhounds will watch over you like few other dogs will. Coonhounds are bred to work with their people at a distance. They pay attention to what you want, and they are good at communicating what they want, especially with a large vocabulary of sighs and excited whimpers. They do need to respect you, though. A coonhound won't pay much attention to someone who is is inattentive to them. They are not blindly obedient either. Smart coonhounds just need to understand what you want ... and why. It's up to you to communicate consistently and understandably. Coonhound love has long been a well kept secret. It's time to spread the word. Download this poster and post it wherever coonhounds are looking for homes, or print copies and ask if local shelters and vet clinics will let you post it. Coonhounds love their kids, adults, and seniors. While all adolescent hunting dogs like coonhounds and labs are very energetic and need socialization and training, a properly-raised adult coonie will be a devoted, snuggly companion. Coonies have a special fondness for children. They are so gentle. 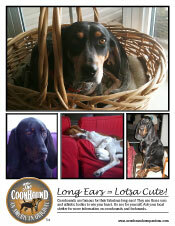 Share this Coonhound poster with adopters and your local shelter! Coonhounds are amazingly cute with their fabulous long ears! It's hard to imagine a more attractive medium or large dog than an American coonhound. They are unique! They have striking coats, streamlined physiques, big eyes, and of course, the EARS. Take a look at the American coonhound and foxhound breeds if you are thinking of adopting a family pet. Share this poster with friends! Coonhounds love to be outdoors with their people! Take your coonie on hikes, jogs, walks, and camping. 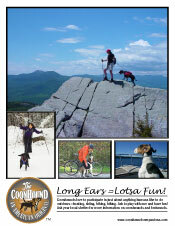 Our "Fun" poster features an American Black & Tan Coonhound named Olivia. Coonhounds can be trained to skijor and run beside a bike. They are just as happy to sit in front of a speeding boat as well! Download this poster to share. Coonhounds are athletic, willing, and talented. This poster illustrates the fabulous style and passion that coonhounds are known for. Blaze, a Treeing Walker Coonhound, flies over the course. Did you think they could only hunt? Wake up America. Coonhounds are only limited by your imagination. Download this poster to share. "Coonhounds--We Love These All-American Characters"
This flyer gives a fun take on the endearing features that make coonhounds and foxhounds such great pets, as well as a few warnings about features that might make them a mismatch for some families. This is a great free handout for shelters, rescues, adoption events and the like to give to anyone who sees a coonhound or foxhound they might be interested in adopting, but knows little about the breeds. Many of our hounds' finest features--their musical voices, beautiful long ears, their amazing focus on scents--have some drawbacks even if they are enchanting to the right people. We want to see more coonhounds and foxhounds adopted, but we want them to go to forever homes, not places where they will bounce right back into the adoption pool. If the potential new owner smiles when they read this, you have a good match. If a horrified look crosses their face, it isn't! Print copies of this flyer to keep near the coonies you are showing to potential adopters.